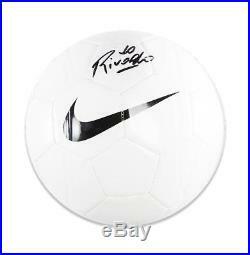 Rivaldo Signed White Nike Ball In Acrylic Display Case – Signed Sports Memorabilia – Icons Memorabilia. Rivaldo Signed White Nike Ball In Acrylic Display Case. This iconic white Nike Brazil ball was personally signed by national hero Rivaldo during a private signing session organised and conducted by Icons in London on July 14th, 2017. Each signed ball comes with an official Icons Certificate of Authenticity, which carries an image of Rivaldo signing the ball, as well as providing details of when and where the item was signed. If you love the mercurial forward, you won’t want to miss this amazing signed item – so grab yours today while stocks last. Please note: Due to the fact that every signed item we sell is hand signed the image displayed of the product is used as an example – the signature size, position and style may vary slightly. Not many players score as many astonishing goals as Rivaldo did. He scored the sort of bicycle kicks, free-kicks and long range missiles that mere mortals could never pull off. Rivaldo was in the best form of his life at Barcelona and even won the World Player of the Year award in 1998, developing into a player that would baffle defenders with his magical first touch and box of tricks. A part of the Brazilian Hall of Fame, Rivaldo is etched in history as one of his football-mad country’s greatest ever players and a shining star its famously triumphant 2002 FIFA World Cup campaign – one that will live long in the memory of every football fan. Our Certificates of Authenticity provide added peace of mind. The certificate displays the date of the signing, the location of the signing and an image of the player signing where available. On top of this our full company details are displayed and the certificate will be signed by a member of the Icons Management team. The certificate will act as our 100% guarantee. Please note, image shown may be an example. Authenticity is everything to us, as it is everything to our customers. If their answers reassure you then fair enough, we think the case for choosing Icons is compelling. Do they have authentication videos starring the world’s best players? Icons have a unique style of authentication video which showcases our products and connections with the players we sign with. Check out some of our recent videos with Leo Messi, Cristiano Ronaldo, Luis Suarez, Neymar Jr and Gareth Bale, as well as our August signing with the Dutch Masters: Van Basten, Guillit & Rijkaard. What is their company’s history? Icons have been in business since 1999. As such we are one of the oldest memorabilia operators in the country, if not the world. Type in any kind of signed shirt product into Google and we will come out at, or very near the top of any search. This takes many years of hard work to achieve and cannot be done overnight. In this market companies spring up overnight and disappear just as quickly. Longevity, history and reputation in this business mean everything. Do they have official licenses? Icons were awarded the world’s first ever signed football memorabilia licence by FIFA in 2010 so we could produce a range of signed iconic World Cup products. We went on to create a range for FIFA 2014 Brazil and have been awarded the rights for FIFA 2018 Russia. In July 2012 Icons was awarded the first ever official licence for the UEFA Champions League and again we resigned for the seasons 2015-18. Our rights now included the UEFA Europa League and both ranges incorporate the whole history of all the elite European competitions. In 2015 we were also given the first ever UEFA European Championship memorabilia licence. As such we’ve just launched our official UEFA Euro2016 France range. Also in 2014 Icons launched the first ever individually licensed memorabilia range: The Official Messi Signed Merchandise collection. We are the only company Leo Messi and his management team trust to work with and this 2015/16 marks the 10th season of Icons and Leo working together as we signed with him when he had just broken into the Barcelona first team. Do they deal with the world’s other great memorabilia companies? Icons are the exclusive stockist and distributor of Upper Deck products. Upper Deck have long term contracts with world superstars such as Michael Jordan, LeBron James, Tiger Woods and now Rory McIlroy. We are the only place you can get these unique products in Europe or the Middle East. We work with SE Products from Australia for their unique licensed rugby and cricket memorabilia and Pursuit3 who have the rights for the Olympics and the 2015 Rugby World Cup. Are they stocked by Harrods? Icons products have been stocked in Harrods, the world’s most famous department store, for over eight years now. We are proudly displayed in their Sports Icons section on the fifth floor and integrated into the Sports department. If you go in, ask for an Icons / Harrods representative to talk you through the stock, where it comes from and show you the exclusive products framed especially for our Harrods customers. Who are the people who work for them and what are their backgrounds? Icons has a who’s who section on their website so you can see who the individuals are that are involved in the company, there’s no hiding behind an anonymous corporate facade to disguise the fact that you are dealing with a one man band or a disreputable signed memorabilia company. Edward, our founding Chairman, was Managing Director of Tottenham Hotspur and then Merchandising Director of Manchester United. Dan, our CEO, has an economics degree from Cambridge and has worked on the strategy of the biggest media brands such as The Guardian, Capital Radio, Channel 4 and Lastminute. All our site editors have journalistic backgrounds to ensure the highest levels of accuracy and our customer service manager Margaret has 30 years’ experience in this field. Are they advised by the country’s leading Intellectual property law firm? Everything Icons does is of the highest professional standards. We are advised by Harbottle & Lewis so we are up to date in terms of legal aspects of image rights, IP and contract law. Do they have testimonials on their site from customers? Icons send a customer service survey to every customer. We ask for feedback and if a customer would like us to add a testimonial to the site. 99% of our responses are positive and we constantly update the product testimonials on our site. These are from real people who love what we do. Do you ever see their products on TV? Icons have a long term partnership with Sky Sports and our giveaways have been featured on air and on line for over six years now. We have worked with ESPN for two years as they integrated our products into their Talk of the Terrace show. Further afield we have worked with Fox Sports in the US for two years and this year started working with NTV in Japan and Eurosport in Korea. Big brands only deal with reputable suppliers as you might expect. Do they have international distribution? Icons is an international brand and we supply to well over 90 countries each year. We have representatives in North America and regularly supply customers in Japan, Australia and the Middle East. We have a Spanish website for our Spanish fans and with the popularity of the game across the world Icons are happy to bring products signed by the world’s best players to fans all over the planet. What distribution partners do they have? Icons have a wide range of distribution partners around the world. We work with Upper Deck and Steiner Sports who provide us with our US sports memorabilia, and up until 2011 Icons were the only memorabilia brand stocked in Saks Fifth Avenue in Saudi Arabia. Icons even reach as far as Japan where IBEX cards are one of our best partners and work with 5USport in greater China who are bringing our iconic products to this new audience. How good is their packaging? Anyone can copy packaging, anyone can design a logo, anyone can commission a hologram. Icons only work with the best suppliers in each field: One Vision do our framing, Cedar Packaging do our packaging and Opsec Security design and manufacture our unique holograms. Other companies send out their products in plastic bags and no-one else gives their customers the option of tournament branded deluxe presentation boxes. We take the time to present the world’s best signed merchandise in the world’s best way. How good is their Certificate of Authenticity? Anyone with a word processor can create a COA. All our items come with a Certificate of Authenticity, which includes the details of the signing session and a photo of the player signing the product line at the signing session, where available. Details of our company are registered with Companies House and our company number is 06791294, this is always displayed on the COAs. We are easily traceable and subject to UK law. If you can’t find a company’s details on its website then proceed with caution and remember you will have no claims in the courts. Our MD personally signs every COA, we don’t reproduce any signatures, ever, even for this small task. We set the standards in the market, everyone else copies us. How do they get their signatures? We deal with players’ representatives. Because we have worked with the players and their agents for many years, they trust us, and often recommend us to each other personally. What are their prices like? Icons products can be more expensive, we know that. If it’s much cheaper you have every right to be suspicious. Why are they members of UACC or similar organisations? There is no vetting of the companies or their products. From our point of view we think working with Messi and Ronaldo for over a decade, producing high quality authenticity videos, having a FIFA licence, being the first ever official memorabilia company to work with UEFA and being stocked in Harrods is the kind of reassurance the public respects. Icons have the highest possible standards for our products and service. We have been trading online since 1999 and have had thousands of happy customers. All our shirts arrive in presentation packaging which make them the perfect gift. Our aim is to provide you, our customers, with amazing signed memorabilia, which makes an incredible present for someone special, or as a gift for yourself! We strive to match the unparalleled quality of our memorabilia with customer services of the highest standard. The item “Rivaldo Signed White Nike Ball In Acrylic Display Case Autograph” is in sale since Wednesday, December 5, 2018. This item is in the category “Sports Memorabilia\Football Memorabilia\Autographs (Original)\Signed Shirts\Premiership Players/ Clubs”. The seller is “icons-memorabilia” and is located in London. This item can be shipped worldwide. 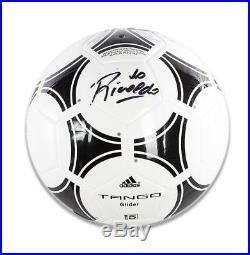 Rivaldo Signed Adidas Tango Ball In Acrylic Display Case – Signed Sports Memorabilia – Icons Memorabilia. 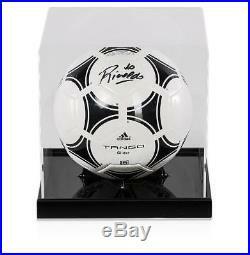 Rivaldo Signed Adidas Tango Ball In Acrylic Display Case. This stunning and iconic Adidas Tango ball was personally signed by Brazilian legend Rivaldo during a private signing session organised and conducted by Icons in London on July 14th, 2017. Each signed ball comes with an official Icons Certificate of Authenticity, which carries an image of Rivaldo signing the ball, as well as providing details of when and where the item was signed. If you love the mercurial forward, you won’t want to miss this amazing signed item – so grab yours today while stocks last. Please note: Due to the fact that every signed item we sell is hand signed the image displayed of the product is used as an example – the signature size, position and style may vary slightly. Not many players score as many astonishing goals as Rivaldo did. He scored the sort of bicycle kicks, free-kicks and long range missiles that mere mortals could never pull off. Rivaldo was in the best form of his life at Barcelona and even won the World Player of the Year award in 1998, developing into a player that would baffle defenders with his magical first touch and box of tricks. A part of the Brazilian Hall of Fame, Rivaldo is etched in history as one of his football-mad country’s greatest ever players and a shining star its famously triumphant 2002 FIFA World Cup campaign – one that will live long in the memory of every football fan. Our Certificates of Authenticity provide added peace of mind. The certificate displays the date of the signing, the location of the signing and an image of the player signing where available. On top of this our full company details are displayed and the certificate will be signed by a member of the Icons Management team. The certificate will act as our 100% guarantee. Please note, image shown may be an example. Authenticity is everything to us, as it is everything to our customers. If their answers reassure you then fair enough, we think the case for choosing Icons is compelling. Do they have authentication videos starring the world’s best players? Icons have a unique style of authentication video which showcases our products and connections with the players we sign with. Check out some of our recent videos with Leo Messi, Cristiano Ronaldo, Luis Suarez, Neymar Jr and Gareth Bale, as well as our August signing with the Dutch Masters: Van Basten, Guillit & Rijkaard. What is their company’s history? Icons have been in business since 1999. As such we are one of the oldest memorabilia operators in the country, if not the world. Type in any kind of signed shirt product into Google and we will come out at, or very near the top of any search. This takes many years of hard work to achieve and cannot be done overnight. In this market companies spring up overnight and disappear just as quickly. Longevity, history and reputation in this business mean everything. Do they have official licenses? Icons were awarded the world’s first ever signed football memorabilia licence by FIFA in 2010 so we could produce a range of signed iconic World Cup products. We went on to create a range for FIFA 2014 Brazil and have been awarded the rights for FIFA 2018 Russia. In July 2012 Icons was awarded the first ever official licence for the UEFA Champions League and again we resigned for the seasons 2015-18. Our rights now included the UEFA Europa League and both ranges incorporate the whole history of all the elite European competitions. In 2015 we were also given the first ever UEFA European Championship memorabilia licence. As such we’ve just launched our official UEFA Euro2016 France range. Also in 2014 Icons launched the first ever individually licensed memorabilia range: The Official Messi Signed Merchandise collection. We are the only company Leo Messi and his management team trust to work with and this 2015/16 marks the 10th season of Icons and Leo working together as we signed with him when he had just broken into the Barcelona first team. Do they deal with the world’s other great memorabilia companies? Icons are the exclusive stockist and distributor of Upper Deck products. Upper Deck have long term contracts with world superstars such as Michael Jordan, LeBron James, Tiger Woods and now Rory McIlroy. We are the only place you can get these unique products in Europe or the Middle East. We work with SE Products from Australia for their unique licensed rugby and cricket memorabilia and Pursuit3 who have the rights for the Olympics and the 2015 Rugby World Cup. Are they stocked by Harrods? Icons products have been stocked in Harrods, the world’s most famous department store, for over eight years now. We are proudly displayed in their Sports Icons section on the fifth floor and integrated into the Sports department. If you go in, ask for an Icons / Harrods representative to talk you through the stock, where it comes from and show you the exclusive products framed especially for our Harrods customers. Who are the people who work for them and what are their backgrounds? Icons has a who’s who section on their website so you can see who the individuals are that are involved in the company, there’s no hiding behind an anonymous corporate facade to disguise the fact that you are dealing with a one man band or a disreputable signed memorabilia company. Edward, our founding Chairman, was Managing Director of Tottenham Hotspur and then Merchandising Director of Manchester United. Dan, our CEO, has an economics degree from Cambridge and has worked on the strategy of the biggest media brands such as The Guardian, Capital Radio, Channel 4 and Lastminute. All our site editors have journalistic backgrounds to ensure the highest levels of accuracy and our customer service manager Margaret has 30 years’ experience in this field. Are they advised by the country’s leading Intellectual property law firm? Everything Icons does is of the highest professional standards. We are advised by Harbottle & Lewis so we are up to date in terms of legal aspects of image rights, IP and contract law. Do they have testimonials on their site from customers? Icons send a customer service survey to every customer. We ask for feedback and if a customer would like us to add a testimonial to the site. 99% of our responses are positive and we constantly update the product testimonials on our site. These are from real people who love what we do. Do you ever see their products on TV? Icons have a long term partnership with Sky Sports and our giveaways have been featured on air and on line for over six years now. We have worked with ESPN for two years as they integrated our products into their Talk of the Terrace show. Further afield we have worked with Fox Sports in the US for two years and this year started working with NTV in Japan and Eurosport in Korea. Big brands only deal with reputable suppliers as you might expect. Do they have international distribution? Icons is an international brand and we supply to well over 90 countries each year. We have representatives in North America and regularly supply customers in Japan, Australia and the Middle East. We have a Spanish website for our Spanish fans and with the popularity of the game across the world Icons are happy to bring products signed by the world’s best players to fans all over the planet. What distribution partners do they have? Icons have a wide range of distribution partners around the world. We work with Upper Deck and Steiner Sports who provide us with our US sports memorabilia, and up until 2011 Icons were the only memorabilia brand stocked in Saks Fifth Avenue in Saudi Arabia. Icons even reach as far as Japan where IBEX cards are one of our best partners and work with 5USport in greater China who are bringing our iconic products to this new audience. How good is their packaging? Anyone can copy packaging, anyone can design a logo, anyone can commission a hologram. Icons only work with the best suppliers in each field: One Vision do our framing, Cedar Packaging do our packaging and Opsec Security design and manufacture our unique holograms. Other companies send out their products in plastic bags and no-one else gives their customers the option of tournament branded deluxe presentation boxes. We take the time to present the world’s best signed merchandise in the world’s best way. How good is their Certificate of Authenticity? Anyone with a word processor can create a COA. All our items come with a Certificate of Authenticity, which includes the details of the signing session and a photo of the player signing the product line at the signing session, where available. Details of our company are registered with Companies House and our company number is 06791294, this is always displayed on the COAs. We are easily traceable and subject to UK law. If you can’t find a company’s details on its website then proceed with caution and remember you will have no claims in the courts. Our MD personally signs every COA, we don’t reproduce any signatures, ever, even for this small task. We set the standards in the market, everyone else copies us. How do they get their signatures? We deal with players’ representatives. Because we have worked with the players and their agents for many years, they trust us, and often recommend us to each other personally. What are their prices like? Icons products can be more expensive, we know that. If it’s much cheaper you have every right to be suspicious. Why are they members of UACC or similar organisations? There is no vetting of the companies or their products. From our point of view we think working with Messi and Ronaldo for over a decade, producing high quality authenticity videos, having a FIFA licence, being the first ever official memorabilia company to work with UEFA and being stocked in Harrods is the kind of reassurance the public respects. Icons have the highest possible standards for our products and service. We have been trading online since 1999 and have had thousands of happy customers. All our shirts arrive in presentation packaging which make them the perfect gift. Our aim is to provide you, our customers, with amazing signed memorabilia, which makes an incredible present for someone special, or as a gift for yourself! We strive to match the unparalleled quality of our memorabilia with customer services of the highest standard. The item “Rivaldo Signed Adidas Tango Ball In Acrylic Display Case Autograph” is in sale since Monday, September 3, 2018. This item is in the category “Sports Memorabilia\Football Memorabilia\Autographs (Original)\Signed Shirts\Premiership Players/ Clubs”. The seller is “icons-memorabilia” and is located in London. This item can be shipped worldwide. 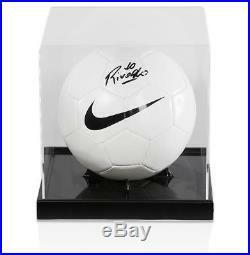 Rivaldo Signed White Nike Ball In Acrylic Display Case – Signed Sports Memorabilia – Icons Memorabilia. Rivaldo Signed White Nike Ball In Acrylic Display Case. This iconic white Nike Brazil ball was personally signed by national hero Rivaldo during a private signing session organised and conducted by Icons in London on July 14th, 2017. Each signed ball comes with an official Icons Certificate of Authenticity, which carries an image of Rivaldo signing the ball, as well as providing details of when and where the item was signed. If you love the mercurial forward, you won’t want to miss this amazing signed item – so grab yours today while stocks last. Please note: Due to the fact that every signed item we sell is hand signed the image displayed of the product is used as an example – the signature size, position and style may vary slightly. Not many players score as many astonishing goals as Rivaldo did. He scored the sort of bicycle kicks, free-kicks and long range missiles that mere mortals could never pull off. Rivaldo was in the best form of his life at Barcelona and even won the World Player of the Year award in 1998, developing into a player that would baffle defenders with his magical first touch and box of tricks. A part of the Brazilian Hall of Fame, Rivaldo is etched in history as one of his football-mad country’s greatest ever players and a shining star its famously triumphant 2002 FIFA World Cup campaign – one that will live long in the memory of every football fan. Our Certificates of Authenticity provide added peace of mind. The certificate displays the date of the signing, the location of the signing and an image of the player signing where available. On top of this our full company details are displayed and the certificate will be signed by a member of the Icons Management team. The certificate will act as our 100% guarantee. Please note, image shown may be an example. Authenticity is everything to us, as it is everything to our customers. If their answers reassure you then fair enough, we think the case for choosing Icons is compelling. Do they have authentication videos starring the world’s best players? Icons have a unique style of authentication video which showcases our products and connections with the players we sign with. Check out some of our recent videos with Leo Messi, Cristiano Ronaldo, Luis Suarez, Neymar Jr and Gareth Bale, as well as our August signing with the Dutch Masters: Van Basten, Guillit & Rijkaard. What is their company’s history? Icons have been in business since 1999. As such we are one of the oldest memorabilia operators in the country, if not the world. Type in any kind of signed shirt product into Google and we will come out at, or very near the top of any search. This takes many years of hard work to achieve and cannot be done overnight. In this market companies spring up overnight and disappear just as quickly. Longevity, history and reputation in this business mean everything. Do they have official licenses? Icons were awarded the world’s first ever signed football memorabilia licence by FIFA in 2010 so we could produce a range of signed iconic World Cup products. We went on to create a range for FIFA 2014 Brazil and have been awarded the rights for FIFA 2018 Russia. In July 2012 Icons was awarded the first ever official licence for the UEFA Champions League and again we resigned for the seasons 2015-18. Our rights now included the UEFA Europa League and both ranges incorporate the whole history of all the elite European competitions. In 2015 we were also given the first ever UEFA European Championship memorabilia licence. As such we’ve just launched our official UEFA Euro2016 France range. Also in 2014 Icons launched the first ever individually licensed memorabilia range: The Official Messi Signed Merchandise collection. We are the only company Leo Messi and his management team trust to work with and this 2015/16 marks the 10th season of Icons and Leo working together as we signed with him when he had just broken into the Barcelona first team. Do they deal with the world’s other great memorabilia companies? Icons are the exclusive stockist and distributor of Upper Deck products. Upper Deck have long term contracts with world superstars such as Michael Jordan, LeBron James, Tiger Woods and now Rory McIlroy. We are the only place you can get these unique products in Europe or the Middle East. We work with SE Products from Australia for their unique licensed rugby and cricket memorabilia and Pursuit3 who have the rights for the Olympics and the 2015 Rugby World Cup. Are they stocked by Harrods? Icons products have been stocked in Harrods, the world’s most famous department store, for over eight years now. We are proudly displayed in their Sports Icons section on the fifth floor and integrated into the Sports department. If you go in, ask for an Icons / Harrods representative to talk you through the stock, where it comes from and show you the exclusive products framed especially for our Harrods customers. Who are the people who work for them and what are their backgrounds? Icons has a who’s who section on their website so you can see who the individuals are that are involved in the company, there’s no hiding behind an anonymous corporate facade to disguise the fact that you are dealing with a one man band or a disreputable signed memorabilia company. Edward, our founding Chairman, was Managing Director of Tottenham Hotspur and then Merchandising Director of Manchester United. Dan, our CEO, has an economics degree from Cambridge and has worked on the strategy of the biggest media brands such as The Guardian, Capital Radio, Channel 4 and Lastminute. All our site editors have journalistic backgrounds to ensure the highest levels of accuracy and our customer service manager Margaret has 30 years’ experience in this field. Are they advised by the country’s leading Intellectual property law firm? Everything Icons does is of the highest professional standards. We are advised by Harbottle & Lewis so we are up to date in terms of legal aspects of image rights, IP and contract law. Do they have testimonials on their site from customers? Icons send a customer service survey to every customer. We ask for feedback and if a customer would like us to add a testimonial to the site. 99% of our responses are positive and we constantly update the product testimonials on our site. These are from real people who love what we do. Do you ever see their products on TV? Icons have a long term partnership with Sky Sports and our giveaways have been featured on air and on line for over six years now. We have worked with ESPN for two years as they integrated our products into their Talk of the Terrace show. Further afield we have worked with Fox Sports in the US for two years and this year started working with NTV in Japan and Eurosport in Korea. Big brands only deal with reputable suppliers as you might expect. Do they have international distribution? Icons is an international brand and we supply to well over 90 countries each year. We have representatives in North America and regularly supply customers in Japan, Australia and the Middle East. We have a Spanish website for our Spanish fans and with the popularity of the game across the world Icons are happy to bring products signed by the world’s best players to fans all over the planet. What distribution partners do they have? Icons have a wide range of distribution partners around the world. We work with Upper Deck and Steiner Sports who provide us with our US sports memorabilia, and up until 2011 Icons were the only memorabilia brand stocked in Saks Fifth Avenue in Saudi Arabia. Icons even reach as far as Japan where IBEX cards are one of our best partners and work with 5USport in greater China who are bringing our iconic products to this new audience. How good is their packaging? Anyone can copy packaging, anyone can design a logo, anyone can commission a hologram. Icons only work with the best suppliers in each field: One Vision do our framing, Cedar Packaging do our packaging and Opsec Security design and manufacture our unique holograms. Other companies send out their products in plastic bags and no-one else gives their customers the option of tournament branded deluxe presentation boxes. We take the time to present the world’s best signed merchandise in the world’s best way. How good is their Certificate of Authenticity? Anyone with a word processor can create a COA. All our items come with a Certificate of Authenticity, which includes the details of the signing session and a photo of the player signing the product line at the signing session, where available. Details of our company are registered with Companies House and our company number is 06791294, this is always displayed on the COAs. We are easily traceable and subject to UK law. If you can’t find a company’s details on its website then proceed with caution and remember you will have no claims in the courts. Our MD personally signs every COA, we don’t reproduce any signatures, ever, even for this small task. We set the standards in the market, everyone else copies us. How do they get their signatures? We deal with players’ representatives. Because we have worked with the players and their agents for many years, they trust us, and often recommend us to each other personally. What are their prices like? Icons products can be more expensive, we know that. If it’s much cheaper you have every right to be suspicious. Why are they members of UACC or similar organisations? There is no vetting of the companies or their products. From our point of view we think working with Messi and Ronaldo for over a decade, producing high quality authenticity videos, having a FIFA licence, being the first ever official memorabilia company to work with UEFA and being stocked in Harrods is the kind of reassurance the public respects. Icons have the highest possible standards for our products and service. We have been trading online since 1999 and have had thousands of happy customers. All our shirts arrive in presentation packaging which make them the perfect gift. Our aim is to provide you, our customers, with amazing signed memorabilia, which makes an incredible present for someone special, or as a gift for yourself! We strive to match the unparalleled quality of our memorabilia with customer services of the highest standard. 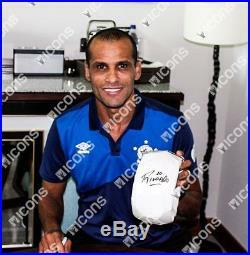 The item “Rivaldo Signed White Nike Ball In Acrylic Display Case Autograph” is in sale since Monday, September 3, 2018. This item is in the category “Sports Memorabilia\Football Memorabilia\Autographs (Original)\Signed Shirts\Premiership Players/ Clubs”. The seller is “icons-memorabilia” and is located in London. This item can be shipped worldwide.